LISTEN UP, PHILIP is yet another New York-set indie film about life and love among the creative class. 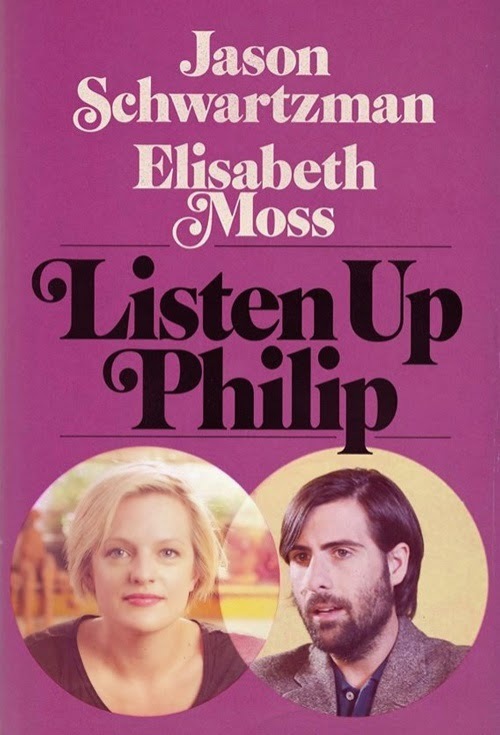 It's protagonist Philip (Jason Schwarzman) is an angry, self-absorbed writer so obnoxious that you'd be looking for an exit within five minutes of meeting him. This movie asks us to spend almost two hours with the guy. Although considered of some import in the literary world, Philip is far from financially secure. And yet, even as his second book is about to be released, he refuses to do any press for it. Fortunately his photographer girlfriend Ashley (Elizabeth Moss) is doing well enough to support both of them. Nonetheless, Philip takes Ashley for granted and puts his own needs ahead of her career. As a result, her feelings for Philip have slowly but surely been cooling. The last straw is when Philip decides to spend the summer hanging out with an older writer he looks up to, Ike (Jonathan Pryce). Completely cut off from all his family and friends except for his daughter Melanie (Krysten Ritter), Ike is essentially what Philip will become if he stays on his present course. In the film's one tolerable section, we see Ashley moving on with her life in Philip's absence. When Philip returns to what he believes is still his hiome, she tells him in no uncertain terms that they're through, but it doesn't quite seem to register. Even later, when Philip takes a job teaching creative writing at a college and enters into a relationship with another teacher, Yvette (Joséphine de La Baume), he still hangs on to the belief that Ashley will be waiting for him in New York. There is no real character arc for Philip. At one point, the film's narrator (Eric Bogosian) tells us that Philip's relationship with Yvette makes him more tolerable, and that this leads to him finding friends among the college faculty. The thing is, we never actually see this, and whatever transformation takes place is apparently short lived. As far as we the audience are concerned, Philip is an insufferable prick from start to finish. Our only respite from Philip's unpleasantness comes when the film spends a little time showing us how Ashley gets on in his absence. Not only is she at least somewhat likeable, she's also the only character in the film who grows and changes. Despite getting equal space on the film's poster, though, Ashley is by no means given equal screen time, and her time in the spotlight is over all too soon. One can understand why an actor like Schwartzman might relish the chance to play such an irredeemable character, and he certainly does it well. There's also no reason why a film about a misanthropic narcissist can't be enjoyable: THERE WILL BE BLOOD is one of my favorite films. As horrible a human being as Daniel Day Lewis' Daniel Plainview is in that film, though, there is always some shred of humanity to allow the viewer to empathize with him, and more than enough of interest in his journey towards self destruction to make it worth enduring his company for the duration. That simply isn't the case here. PHILIP also violates one of the cardinal rules of storytelling in that it constantly tells rather than shows, using Bogosian's narration to advance the plot instead of what we actually see on screen. The grainy, overexposed, and often intentionally out of focus cinematography also grates. Both choices come across as indie affectations that do little to actually serve the material. Even when there are some minor chuckles to be derived from the its dark and deadpan depiction of insufferable artist types, the film is so insufferably arty itself that it's hard to justify slogging through for such meager rewards. 2 out of 4 stars.